Micro-Touch Latex Powder Free Gloves are made from natural rubber latex, feature extra long reinforced cuffs, and are thicker for extra protection, making them ideal for use in higher risk clinical applications. These powder-free gloves are hand specific, which allow for added comfort and fit. Size 5 1/2, Size 6, Size 6 1/2, Size 7, Size 7 1/2, Size 8, Size 8 1/2, Size 9. Micro-Touch® NextStep® gloves with a glycerol moisturizer provide superior protection and tactile sensitivity, along with the comfort and advantages of latex. Designed with the healthcare professional’s daily work routine in mind, the light green exam gloves are easy to don, textured for reliable grip, and nourish skin during use. The Micro-Touch® Plus examination glove is made from natural rubber latex and features a polymer coating for ease of donning, with a textured wet-grip surface. It is powder-free to help eliminate powder-related complications and is manufactured to meet or exceed ASTM standards. Recommended for use when: A secure grip is needed in wet and dry environments. Working with small instruments requires maximum sensitivity. The Ultra One® glove is a favorite among high-risk professionals for good reason. It offers durability and solid protection while providing the tactile sensitivity of an examination glove. Longer, with an extended, beaded cuff for increased protection over the wrist and arm, the Ultra One® glove is a proven performer. Recommended for use when: Strength and durability are a requirement on a regular basis. Working with utensils and instruments in mid-to heavy-duty environments. The Evolution One® glove was rated “Excellent Overall” by an independent panel of dentists, hygienists, dental assistants and laboratory technicians. * The Evolution One® glove is lightly chlorinated for greater glove stability. Longer and thicker for added protection, the Evolution One® glove is made to provide greater manual dexterity and tactile sensitivity. Moisturized inner coating offers superior donning and soothing comfort. Exceed worldwide standards for barrier protection, strength, comfort and low protein to minimize the risk of latex protein allergy. Specially coated with USP grade Lanolin and Vitamin E, designed to minimize dry skin irritation associated with frequent hand washing. Mild Citrus-Peppermint scented for a refreshing experience. Enriched and micro-coated with USP Grade Lanolin and Vitamin E to improve skin health and minimize dry skin irritation. Ultra-Soft (low modulus) and pH balanced formulation ensures superior manual desterity and extended comfort. Introducing DASH Futura pH balanced, powder free, latex exam gloves. Anything that comes in contact with your skin's natural protective layer can alter its pH, thereby inhibiting its first line of defense against toxins and potential irritants. DASH Futura gloves guard healthy skin from damaging effects by helping maintain the pH of your skin's natural protective layer. Now you can experience the healing powers of aloe vera first-hand with DASH AloePRO exam gloves. Coated on the inside with soothing Active Aloe™, AloePRO is designed to help moisturize and soften your hands while you work. DASH now offers IsoFlex exam gloves in six numeric sizes, assuring you a comfortable fit every time. IsoFlex exam gloves are non-chlorinated making them odor-free and slip resistant, eliminating the need for a textured surface. Reduced protein, latex examination glove with less than 50µg of protein per gram. This glove is micro-textured for added grip control without loss of tactile sensitivity. Certified with the lowest protein claim allowed by the FDA (50 micrograms or less of water extractable protein). 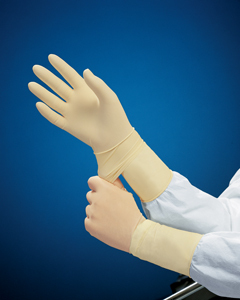 Kimberly Clark Surgical Latex gloves are Powder Free, Low Protein, and fully textured. The Micro-Touch Surgeons Gloves originally made by Johnson and Johnson and later acquired by Ansell are made from high quality Latex. They come in various sizes from 5 1/2 to 9. Perry Style 12 powdered surgical gloves provide uncompromising quality and durability. Their satin smooth finish provides maximum tactile sensitivity and is produced with advanced technology to lower powder and protein levels. Part of the Ansell family of powdered latex gloves, the Micro-Touch® Powder glove features a smooth finish for better tactile sensitivity and a straight reinforced cuff. This glove is made from natural rubber latex for superior hand barrier protection and is powdered with absorbable dusting powder. Professionals who require lightly powdered protection choose Micro One®. This glove features a smooth, non-textured surface. Formulated with premium latex for exceptional comfort, fit and feel. Lightly-powdered and textured, the PowerGrip® glove is an ideal choice for professionals needing a powerful grip. The PowerGrip® glove provides excellent comfort, fit and feel. Features and Benefits: Premium quality, low modulus latex for greater comfort and reduced hand fatigue. Lightly powdered with USP absorbable cornstarch for easy donning. Fully textured for a more secure grip. Meets or exceeds federal guidelines for maximum powder and maximum water extractable protein content. Premium low modulus latex and smooth surface finish provide excellent tactile sensitivity, strength and dexterity. Low level of chemicals, reduce the risk of irritant or contact dermatitis (Type IV). Lightly powdered for comfort and easy donning. Take comfort in knowing there are exam gloves perfectly sized for your hands. Available in six sizes, DASH LP is the professional's solution for exceptional comfort and fit. DASH LP exam gloves are made from high quality, low modulus latex which provides a barrier that is so form fitting, you hardly notice you're wearing gloves at all. All gloves are made of the highest quality latex and our powdered gloves are pre-powdered with a minimum of NDA-approved USP grade corn starch. Economy Exam Latex Gloves by E.W.A. Ltd. These gloves are Ambidextrous, Non-Sterile, have Beaded Cuffs and are Pre-Powdered. Deluxe Super White Exam Latex Gloves by E.W.A. These gloves have Superior fit, strength and sensitivity, surgical quality, and are non-sterile. Gloves are the most important personal barrier to protect against bloodborne pathogen exposure. Every office should have a selection of gloves to meet the needs of each worker, patient and procedure.